The Absolute Best Poutine in New YorkPlus all our belt-loosening favorites, from smoked-meat-enhanced to thoroughly veganized. The White House Will Serve Gourmet Poutine at Tonight’s State DinnerIt marks Canadian prime minister Justin Trudeau’s first visit. Mile End’s Intense 6-Day Poutine Week Returns Next WeekDid someone say General Tso’s poutine? Canadian McDonald’s New McPoutine Has a Genius SecretIt’s not the whole “available for a limited time” thing either. It’s Poutine’s World, We Just Live In ItPoutine Fest and more evidence of poutine’s moment. Someone Tell Portlandia’s WritersAre pickles passe? Khyber to Serve a Proper Poutine For Tomorrow’s Visit From UnibroueThe brewer is bringing beer, and fresh cheese curds from Canada. M. Wells to Make Cameo at Smorgasburg This WeekendStay awhile. Debbie Lee Launches The Poutine TruckThe Food Network star is back with her second truck. Virbila Visits Hostaria del Piccolo; Gold Plays at Playa and Picks Out PoutineThe L.A. Times calls Piccolo’s more approachable branch authentic, while L.A. Weekly finds much to enjoy at John Rivera Sedlar’s breezy new restaurant. Poutine’s Identity CrisisIf poutine’s topped with foie gras and nobody’s there to taste it … is it still poutine? TPoutine Transforms Into Truck?The owner is thinking poutine on wheels. NBC Launches Feast ChicagoA new food blog launches. What to Eat at The Southern, Taking Over Chaise Lounge Next TuesdayChaise Lounge closes to turn into The Southern, a showpiece for chef Cary Taylor. Even Upscale Restaurants Can’t Resist the Allure of PoutineA slew of upscale restaurants have added this decidedly downscale dish to their menu. 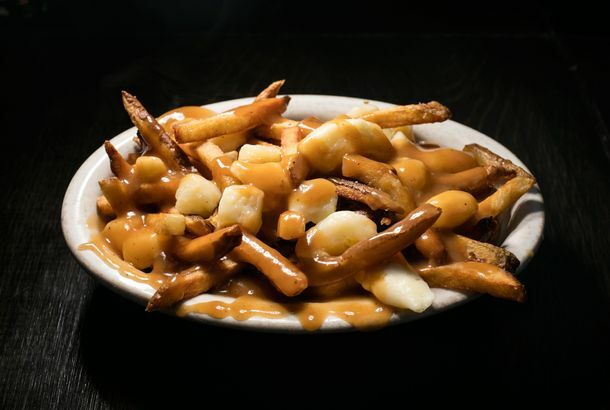 Bostonians Have Access to Plenty of PoutineBut whither Montreal’s other specialties? Haute PoutineDuck-confit poutine appears on the menu at Hotel Griffou. Three’s a trend? Blame Canada: Is Poutine Becoming Routine?TPoutine opens in Manhattan, and a poutine party in Brooklyn.